Gaming company SteelSeries is releasing what it claims is the "world's first modular gaming mouse," the Rival 700. But, I'm not entirely convinced it's the world's first modular gaming mouse, as Mad Catz R.A.T. Pro X also features a fully modular design. Personalization is the goal of the Rival 700, allowing gamers to tailor every aspect of their mouse. While the mouse ships with a 16,000 CPI optical sensor, you'll be able to replace it with other sensors in the future. This means you can upgrade just the tracking sensor without having to buy an entirely new mouse. Additionally, the Rival 700 allows gamers to swap faceplates with different textures and designs. And of course, no gaming mouse would be complete without customizable RGB LED illumination to match your gaming PC's color scheme. The SteelSeries Rival 700 ships with two USB cables, a 3ft rubber cable for gaming on the go and a 6ft braided nylon cable for desktop use. It's nice the USB cable is replaceable as it's usually the first thing to wear out. 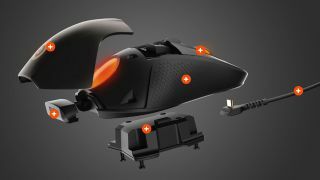 It also sports an OLED display on the side of the mouse where gamers can add even more personalization with custom graphics. You can even upload an animated GIF to loop on the screen. The display can also show your game stats, mouse profiles and CPI settings. It's a neat feature, though I doubt you'll be looking at the display while gaming. Last but not least, the SteelSeries Rival 700 features customizable tactile alerts to notify you when you're low on health health or a reminder to reload. For MOBAs, gamers can set the tactile alert for when cooldowns are up. All of this can be tweaked using the SteelSeries Engine app. I had a chance to try out the Rival 700 at CES 2016 and was impressed by how many customizations could be achieved with the mouse. Its tactile alerts are my favorite feature that I can see myself using all the time. The SteelSeries Rival 700 is available exclusively on the company's website for $99. Here's how to play PC games on a 4K TV.